Did you know that snoring can be a sign of Obstructive Sleep Apnea (OSA)? If you snore at night, particularly if you snore loud enough to disturb your partner, the two of you should probably have a conversation. Ask your partner to observe if you ever stop breathing for brief periods at night. If the answer is yes, you may have OSA, a serious medical condition that requires treatment, and can bear a significant relation to weight loss. Studies show that nearly half of all adult men and over a third of adult women suffer from OSA, and the prevalence increases with age and weight. In some cases there are no apparent symptoms. Weight connection: A prominent feature of OSA is the difficulties with weight loss. About 70% of people with sleep apnea are obese. Abdominal weight gain in particular, is considered to be the most significant risk factor. However, according to a study published by Stanford University Medical School, this is completely reversible with proper diet and exercise. Sometimes other factors can play a role, including low estrogen levels in women, alcohol, smoking and nasal congestion. According to the National Center for Health Statistics, the number of overweight Americans has increased from 47% of the adult population in 1976 to nearly 70% today, with more than half of those individuals being obese (defined as having a height to weight ratio (BMI) over 30) and struggling with weight loss. The likelihood of having OSA is higher in people with a BMI over 25, and in those with waist circumference more than 30 inches for most women or more than 35 inches for most men. Physiology: OSA due to obesity is caused by pressure on the back of the throat from fat deposits around the soft palate and from pressure on the chest wall from large fat deposits in the abdomen. Abdominal fat deposits also increase traction on the trachea, resulting in a narrowed airway. These changes cause obstruction of the airway, resulting in oxygen deprivation, which can damage the heart, brain, blood vessels and adrenal glands. This can result in poor cognitive function, heart disease, metabolic syndrome, diabetes, high cholesterol, difficulties with weight loss and an increased likelihood of accidents while driving or working. Hormone effects: Leptin and grehlin are hormones involved in OSA. Leptin is made in fat cells and decreases appetite. 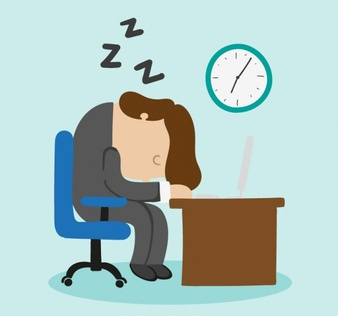 Sleep deprivation can cause leptin levels to decrease in the short term and then increase over the long term, effectively resulting in leptin resistance, which means that there is less leptin in circulation to keep appetite under control. Ghrelin is made by the GI tract and functions to increase appetite. OSA patients have been found to have higher levels of ghrelin. The combination of leptin deficiency and/or resistance along with increased ghrelin levels can cause hunger and cravings, with subsequent weight gain. This reinforces the cycle of obesity and OSA. Treatment: The primary medical treatment for OSA is the use of a CPAP (Continuous Positive Airway Pressure) machine. This is a mask worn during sleep to keep the airway open. Compliance with this device is poor as many patients find it uncomfortable and intrusive. The most effective treatment for the majority of OSA patients is weight loss. As little as 10% weight loss can make a significant difference in sleep quality and results in lower ghrelin levels, making further weight loss easier. If you suspect that you or your partner has sleep apnea, schedule a consultation with your doctor to discuss. While medical oversight is important, a sensible program of diet modification and gradual weight loss can help you to reduce your risk factors and regain your health.